Hybrid electric bikes are all the rage right now, an it’s easy to see why. Offering power assisted travel to aid you on your daily commute, eBikes provide an excellent alternative to sitting in a traffic jam or being crushed and sweaty on public transport. With eBikes able to reach average speeds almost equaling those of a car when driving around a busy city, it’s plain to see why so many people are ditching four wheels for two. When compared to a normal bike, eBikes offer an extra push meaning that you don’t need to sweat it out too much whilst you travel. You can put in as much or as little effort as you like, whilst still making it in time for that all important meeting. Furthermore, they provide added comfort when compared to a sports bike. In opposition to the weight distribution on a road bike, where your body is bent forward with pressure lying on your arms and legs to give balance and thrust, the positioning of your body on a hybrid bike translates to a less strenuous ride, making it far more ergonomic for everyday use. In addition, on a hybrid, your weight is primarily centered at the seat area, thus ensuring there is minimal strain on your arms and legs. For those of us who are not seeking to take part in sporting races, this option is by far preferable as it means your body is less likely to feel the strain of the ride when you reach your destination – usually home or work. By combining elements of both mountain and road bikes, “hybrids” get their name, and are rendered suitable for a whole range of activities, rather than being specialised for a singular task. Here’s a look at some of the top hybrid electric bikes on the market right now. The NCM Moscow eBike (view on Amazon) combines some of the very best brand components to provide a top quality ride. With its sturdy aluminium frame, this bike is built to stand the test of time whilst looking sleek along the way. Custom 250w Das-Kit X15 rear-drive motor has no problem in reaching the top regulated speed of 15.5 miles per hour. With a built-in 21-speed system and 6 levels of pedal-assist, this versatile bike provides a wide range of abilities for all types of journey. High capacity 48v lithium-ion battery allows for an impressive 75 miles of power-assisted travel on full charge. Special feature to increase power on steep hills, allowing you the ultimate power-assisted ride. 100% aluminium alloy frame is both lightweight and durable. The NCM Moscow eBike is a powerful machine with an impressive spec. 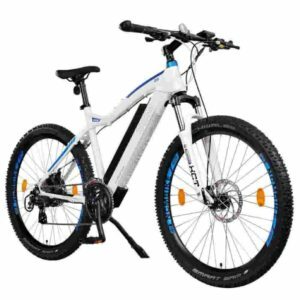 Its high powered functions make it an excellent choice for those seeking a bike that is able to go the distance at a very reasonable price for the performance level. Three riding modes available, including a pure electric drive, pedal assist and no assistance, allowing you to tailor each ride depending on your mood. Impressive maximum cruising speed of 22 miles per hour allows you to reach your destination in record time. Shock absorbing suspension system allows for a smooth and comfortable ride on even the roughest of roads. Up to 53 miles of pedal assisted driving available from one charge. Four inch fat-tires permit travel even on the most unforgiving terrain, meaning you can reach your destination come gravel, snow or sand. 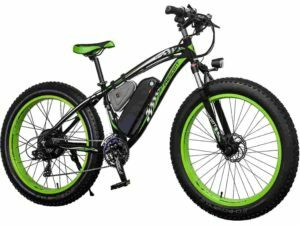 With 21 speeds available and a 48v lithium-ion battery, this model’s spec matches up to that of the NCM Moscow eBike. However, coming in at a significantly higher price, the added features of thick tires and higher speeds are not necessarily worth the extra, unless you are really likely to make use of them. Specially engineered automatic gear system adjusts gears in line with your speed, so you don’t even have to give it a second thought. Three hour charge time for its 36v Lithium-ion battery provides 30 miles of power-assisted travel. High caliber 250w motor can reach a top rate of 15 miles per hour – perfectly adequate for city-travel. Aluminium frame is hard-wearing and lightweight. This model may not be as powerful as the others on the list, but for the price it certainly does the job. If you’re intending on only utilising your eBike for short-distance, on-road travel then this is an excellent choice. 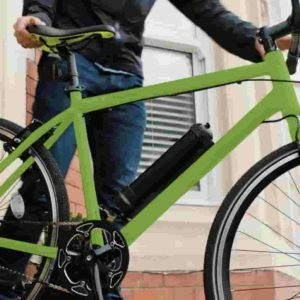 It’s comparatively short charge time means it can be easily recharged whilst you’re at work, making it a perfect option for those looking to commute by eBike. With its clever sensor system designed with ease of use in mind, you can focus on the road with minimal distraction making for a safe ride. These are three great eBikes, each with their own unique benefits. Coming in at a mid to high end price, the NCM Moscow eBike certainly gives you the most bang for your buck. With its impressive 21-speed system and 75 mile capacity it truly is unbeatable for the price. 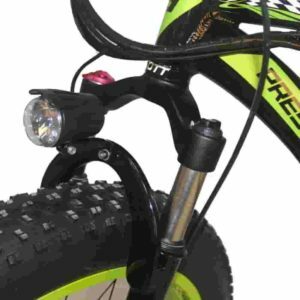 The Prescott Fat Tire Electric Mountain Bike is another striking model with even more powerful features, but at the price it’s only worth the investment if you’re really going to make use of its ability to travel through unusual terrain like sand or snow. If you just want a more basic model at the lower end of the cost spectrum, then the AEROBIKE X-Ride is the perfect choice, as it provides everything you need for casual commuting at a very reasonable price.